If you have qualitative data, you can use it to effectively personalize your data story. Here is a concrete example from a group advocating for changing the built environment to support people making healthy decisions (you can learn more about this topic from the Prevention Institute). 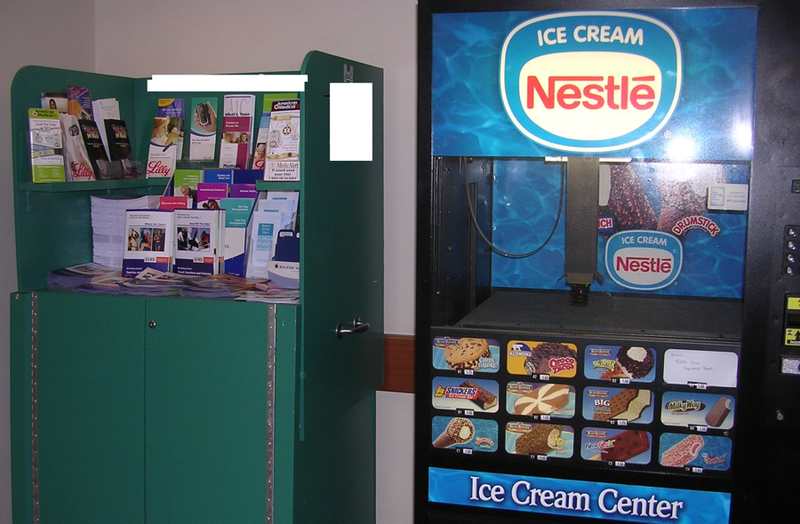 This photo shows a cabinet with brochures about making healthy eating decisions placed right next to an ice cream vending machine. This striking visual irony is good at getting people’s attention! Opening with this kind of evocative image can catch people, giving you a few minutes of their attention to convince them that you’re worth listening to. This image consistently sparks engaged discussion from various audiences – including off-topic ones here at MIT about how awesome it is that the ice cream machine has a robot suction arm! Look around. Take pictures. Think about how you can use an evocative photo to engage your audience around the point you are trying to make. Next Next post: Are You Complexity-Phobic?